Whether you have been reading Father Morris' delightful interpretations since the earliest editions of Magnificat or are being introduced to them for the first time, Regina Cœli: Art and Essays on the Blessed Virgin Mary will increase your love simultaneously for the Mother of God and for a form of art that draws us closer to both Mary and her divine Son. To read an art essay by Father Michael Morris, o.p., is to uncover a richness of expression in both word and imagery. His love of sacred art is unmistakable in the enthusiastic turns of phrase he brings to his writing. His exhaustive knowledge is found in detailed insights. Father Morris shares what he sees, and we are the better for it. 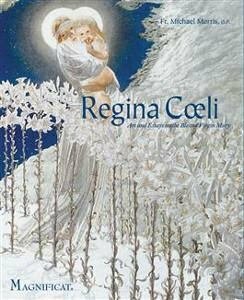 Sadly, Regina Cœli will be one of Father Morris' last published works for Magnificat. Undoubtedly, his love for our Blessed Mother strengthened him to complete this manuscript literally days before he went to his final reward on July 15, 2016. We pray the devotion evident in Regina Cœli will draw you into a deeper relationship with our Lady as you contemplate her role in salvation history. Softcover with flaps. 100 pp.